2005 Topps All American Chrome #29 Roger Staubach (Navy - Dallas Cowboys) #267/555 in mint condition. 1991 Pacific Picks The Pros Gold #11 Barry Sanders (Detroit Lions) in mint condition. 1991 Upper Deck Game Breakers Hologram #GB5 Emmitt Smith (Dallas Cowboys) in mint condition. 2001 Fleer Tradition Art Of A Champion #1 Drew Brees (San Diego Chargers) in mint condition. 1997 Pinnacle Inside Fourth And Goal #F7 Dan Marino (Miami Dolphins) in mint condition. 1997 Collectors Choice Starquest #SQ81 Dan Marino (Miami Dolphins) in mint condition. 2016 Panini Contenders Draft Picks Game Day Tickets #1 Joey Bosa (San Diego Chargers) in mint condition. 2016 Panini Contenders Draft Picks Game Day Tickets #25 Dak Prescott (Dallas Cowboys) in mint condition. 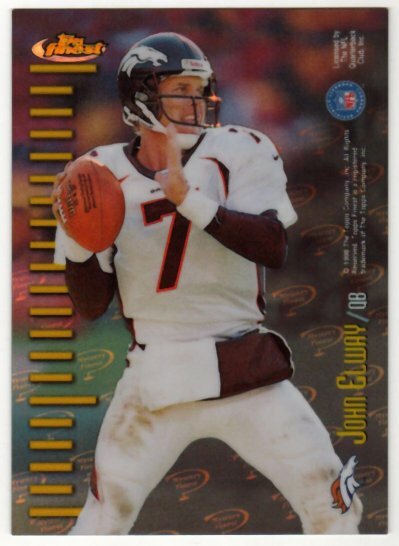 1994 Pinnacle Trophy Collection #12 John Elway (Denver Broncos) in mint condition. 2001 Topps Walter Payton Reprints 1976 #WP1 Walter Payton (Chicago Bears) in mint condition.